Bright Lights recently honored three Bright Lights teachers with length of service awards. Bright Lights teachers teach in their areas of expertise and develop a curriculum to make classes a fun-filled, hands-on experience for the students who take them. Mark Danley was honored for his 15th year as a teacher for Bright Lights. Through the years, he has taught a variety of science based classes and camps but for the past 7 years, his passion has focused on technology in the LEGO Robotics classes. This year, he will be introducing the newly released LEGO Mindstorms EV3 Robotics to students in two day camps. 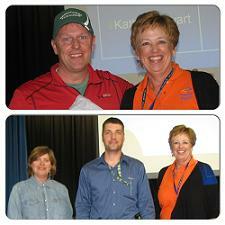 Charley Bittle and Kathy Stewart were honored for their 10 years of dedicated service as Bright Lights teachers. Since 2005, Charley has taught a variety of science based classes and is currently teaching An Unfortunate Series of Events! and Hogwarts Day Camp. Kathy has shared her talents as an artist with students in her popular class Funky Furniture for the past eight years.